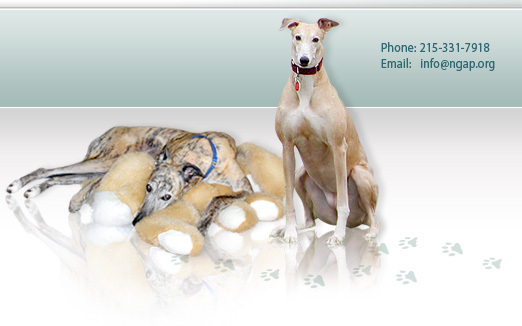 There are many different scenarios under which your greyhound may have to have its leg amputated. It may crash into a wall and have a fracture that is so bad that a leg amputation is the only option. Legs that have less damage can get screws, plates, wiring and a multitude of orthopedic procedures to correct the break so that it will heal correctly. Everyone must consider that factors such as age and cost before beginning either leg amputation or repair. Recently, in-clinic, we were visited by a four-year-old greyhound named Tigger who had a compound fracture in his right leg. His owners first took him to an emergency facility with an orthopedic specialist and were quoted $5000.00 to repair the leg. I do not know if that $5000.00 was all-inclusive or if there would be additional charges for follow-ups and the cost of unexpected things such as blood transfusions. If you don’t have the money, I don’t recommend going in debt to pay for a leg repair and you also don’t have to consider euthanasia as your only other alternative. You can have that same leg amputated at NGAP for a fraction of the cost, which would include a blood transfusion, if necessary and after-care. 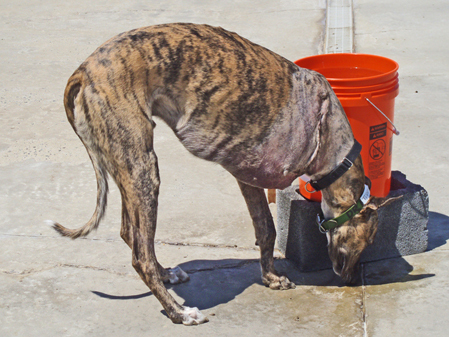 If money dictates your options, you should not feel bad about amputating your greyhound’s leg. 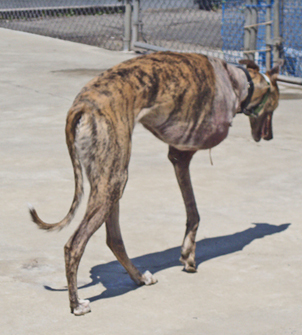 Greyhounds, like most dogs, function very well on just three legs. 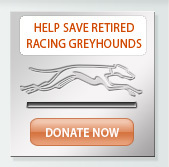 I have even seen footage of a two- legged greyhound running as though it had four! 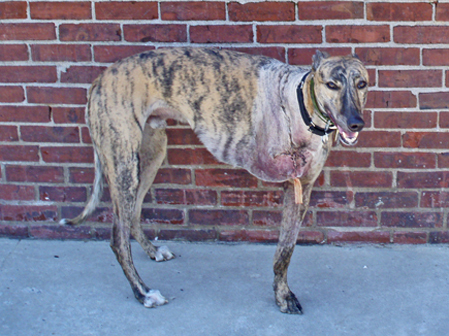 Osteosarcoma is another reason greyhound owners may consider leg amputation. Almost every greyhound we see over 8 years of age that presents to us with a limp ends up being diagnosed with osteosarcoma. Although the potential of long-time survival is getting better, it is still not particularly good. If you are feeling guilty for not amputating the leg for your dog that has cancer, you should not. It is not your fault. Most dogs die of cancer in one form or another. If spending money will cleanse your soul, you can do it. It will function fine for awhile but it will soon die. If we looked at it as an investment, it would be considered a poor one. Before having any veterinary facility amputate your dog’s leg, have them give you a full breakdown of all costs. We sometimes will keep the dog for a week until it is fully functional and not draining fluids. That extra time is included in our basic cost. I suspect that this is not the case at most facilities. If you get your dog home two days after surgery and have ramps in your home, will somebody be there to make sure your greyhound is comfortable and relatively pain free? We feel we are in a better position to monitor a post-operative amputation than most adopters in their home. Don’t feel bad about shopping around. You may find a wide variation in prices. Tigger, who was quoted $5000.00 for repair, had a bad leg to begin with and in our view, repair should not have been given as an option. The orthopedic center should have proposed either amputation or euthanasia. These pictures of Tigger show that he is recovering nicely. Pretty soon he won't even remember he ever had a fourth leg! One Thursday, one of our adopters asked to borrow a live trap for a dog she had seen running loose for a few weeks. She was able to come close enough to feed it, but not to grab it. Surprisingly, she was able to trap the dog in only a few minutes once she had our trap. We saw it in surgery and x-rayed its leg. The dog had a broken leg. The dog’s rightful owners did not want it back because they could not afford the cost of orthopedic surgery, which was an estimated $3000-$5000, or a leg amputation at NGAP for $1500. It turns out that the dog, a pit bull, had a wonderful temperament. NGAP performed the amputation several Fridays ago. At any rate, our adopter raised money and found a new home for this sweet dog that is now running around on three legs. 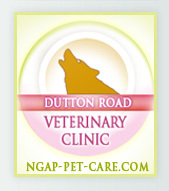 In short, whether you use NGAP’s vets or another vet, you should never be ashamed of doing a leg amputation if that’s what you can afford. Everyone should do the best they can and still feed their family and do all the other necessities of life.